In 1647, William Lilly, renowned throughout England, sat down to write his famous book on astrology. He was ill, but he had foreseen that. He had decided that rather than struggle with clients while sick, he would give himself a year to study, reflect, and write. But before he was quite finished with his book, plague swept through London, killing two of his servants, and forcing Lilly and family to flee to the countryside. This is Book Three, An Easie and plaine Method Teaching How to judge upon Nativities, the conclusion of his great work, Christian Astrology. In this astounding book, Lilly gives not only his own hard-won knowledge of natal astrology, but also what he gleaned from close study of the greatest astrologers in history, as found in his own astrological library, one of the largest of its day. In this book you may learn: . How to determine the Hyleg, or Apheta, the Prorogator of Life. . How to determine intelligence, stature, shape and complexion of the native. . If the native will be rich, and, if so, whether by fair means or foul. . The illnesses he may suffer, if he may die a violent death. .Of Marriage: The number and kinds of spouses, where they may come from, if there will be children or not, and if so, an idea of their number.
. The kind of career best suited to the native, and much more. In the section on Directions and Forecasting, Lilly gives comprehensive interpretations for Primary Directions, Solar Returns and Profections. The book concludes with a priceless analysis of the Nativity of an English Merchant, including more than twenty years of forecasts, up to the time that Lilly judged to be the end of the man's natural life. For the first time, unique to this edition: Spelling and verbs modernized. Glossary of obscure terms, including Latin words and phrases. Calculations in modern format. All 24 solar returns and all 12 profection charts in standard wheel format. Fixed star positions updated to 1 January 2005. Modern symbols for aspects (including minor aspects) used throughout. Primaries untangled, as much as possible. 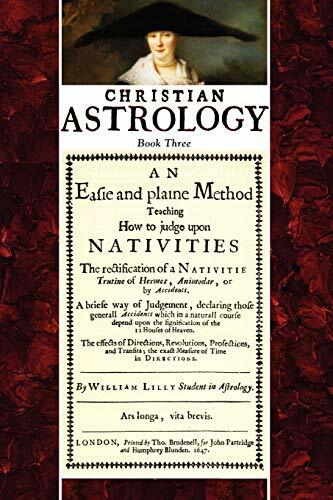 Available separately: Christian Astrology, (books 1 & 2): An Introduction to Astrology, The Resolution of All Manner of Questions, by William Lilly.